^ Devlin, Keith, The Unfinished Game: Pascal, Fermat, and the Seventeenth-Century Letter that Made the World Modern, Basic Books; 1 edition (2008), ISBN 978-0-465-00910-7, p. 24. ^ Landau, James A. Historia Matematica Mailing List Archive: Re: [HM] Pascal's Triangle (mailing list email). Archives of Historia Matematica. 1999-05-08 [2007-04-13]. Bag, Amulya Kumar. Binomial theorem in ancient India. Indian J. History Sci. 1966, 1 (1): 68–74. Graham, Ronald; Knuth, Donald; Patashnik, Oren. (5) Binomial Coefficients. Concrete Mathematics 2nd. Addison Wesley. 1994: 153–256. ISBN 0-201-55802-5. OCLC 17649857. 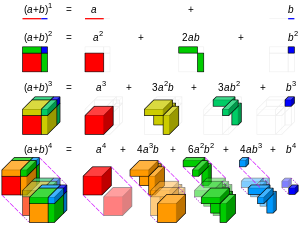 "Binomial Theorem (Step-by-Step)" by Bruce Colletti and Jeff Bryant, Wolfram 演示项目, 2007.